Long(er) walks in The Lot Valley. Long is relative, in this heat 20k seems long. These walks take me into a more diverse landscape. Different valleys and ridges are visited from my base without having to use the car. I have several routes which, this fantastic week, have provided top class excursions. A long morning is set aside for exploration and I’ve returned each time full of admiration for the landscape of the area. As a good example I leave this morning along easy tracks in the oak forest. Sunday scrambler bikes, much as I shun them, help to keep these ways clear. Very few other people use them. Over a ridge little paths brush through aromatic lavender. 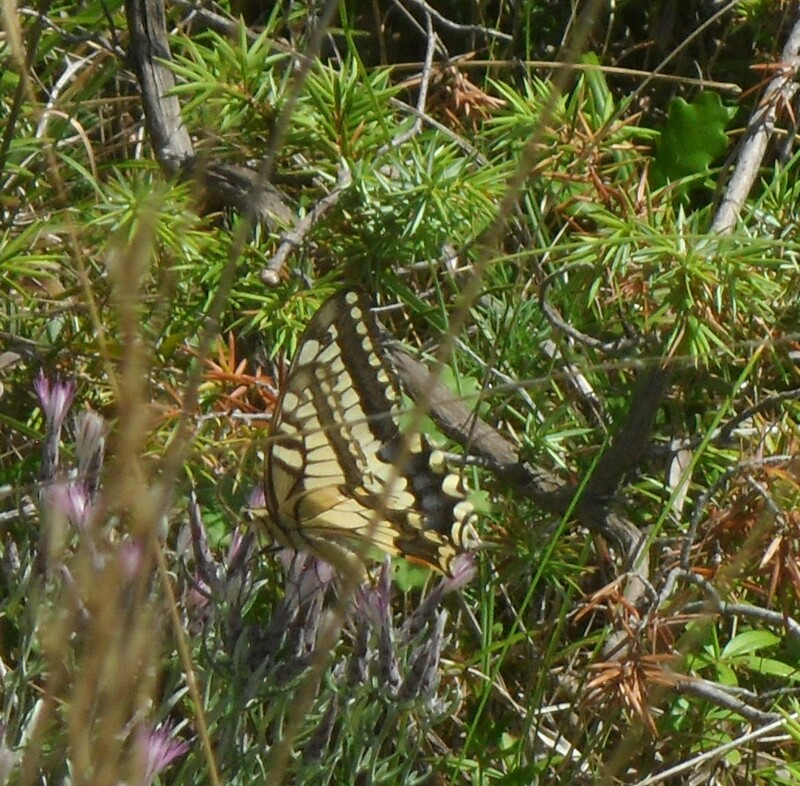 This is a splendid spot for a breather and a chance to admire the varied butterflies and watch the buzzards wheeling overhead. 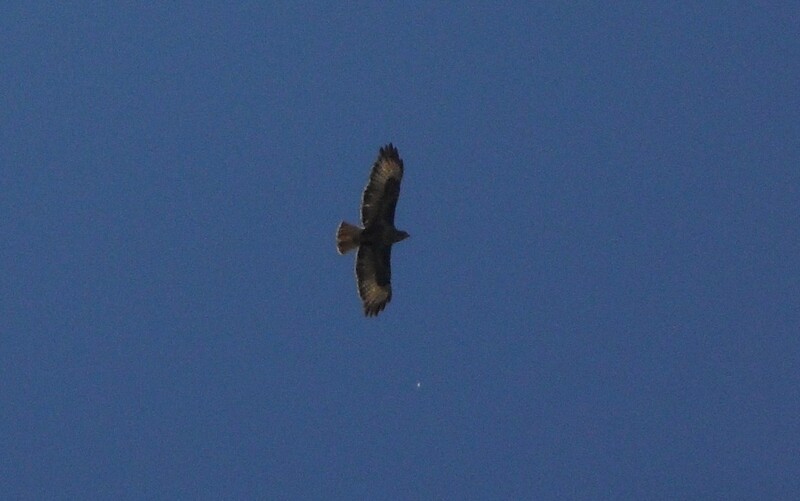 I’ve given up trying to get decent photos of either. 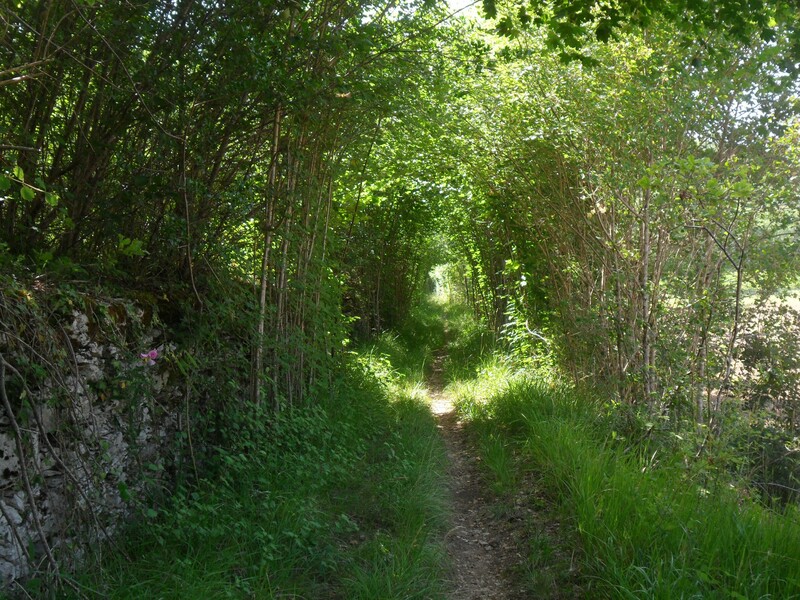 Down into a secluded valley of scattered houses threaded with quiet lanes [ideal for cycling – see later post] and I’m soon into the little village of Touzac. The cafe is closed today but there is a welcome water tap, as there is in all the hamlets passed today. 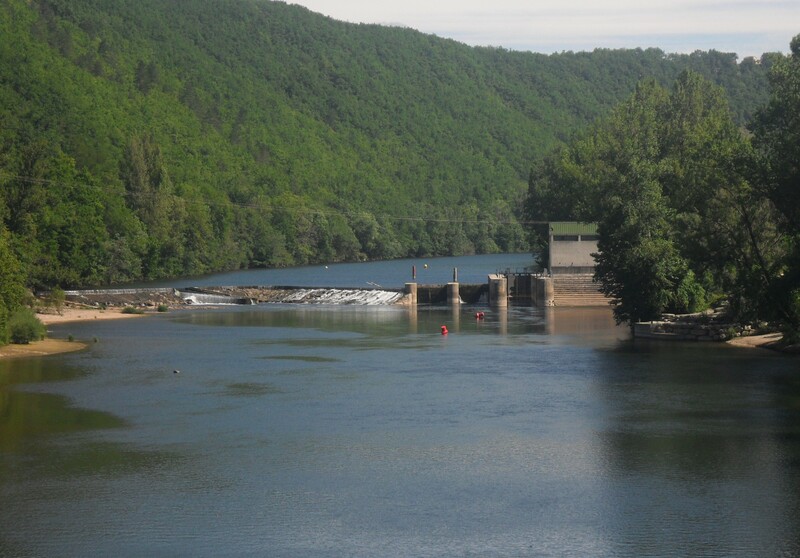 It’s good to reach the River Lot itself, a grand stretch of water, which here is crossed by an impressive metal bridge. A scheme is well under way to restore navigation to this once important river by installing a series of locks thus providing for boat trips as a tourist attraction. 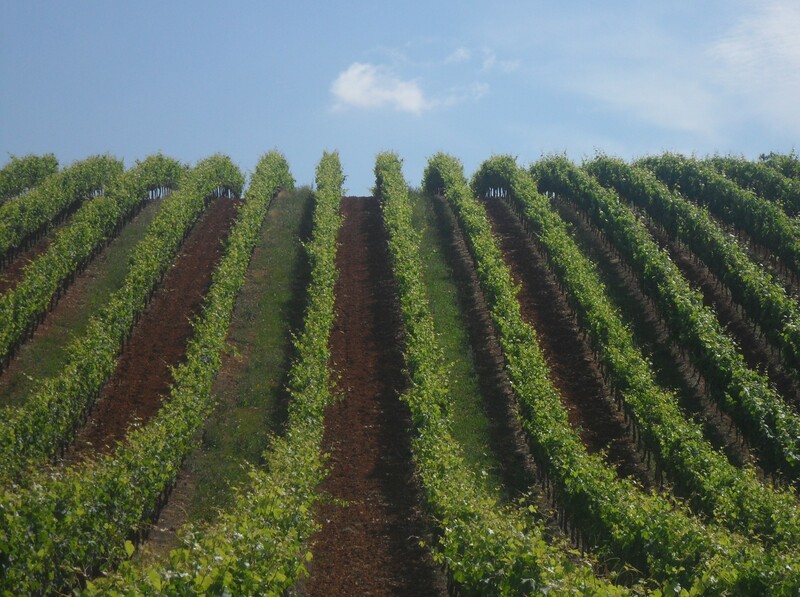 There is a gradual climb up a wooded valley and on past hillsides of tidy vineyards. 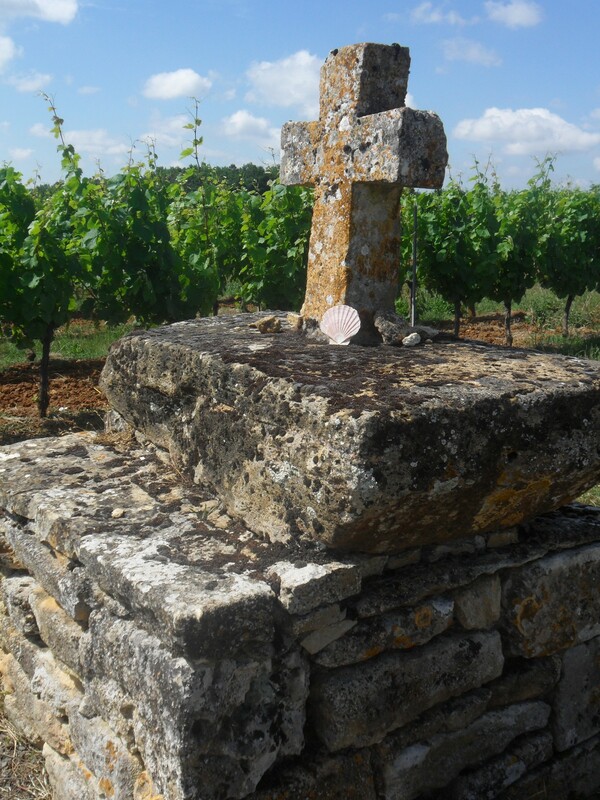 At the top there is a stone cross as this part of the trail is on one of the pilgrimage routes to Santiago de Compostela, hence the Scallop Shell the symbol of the route. 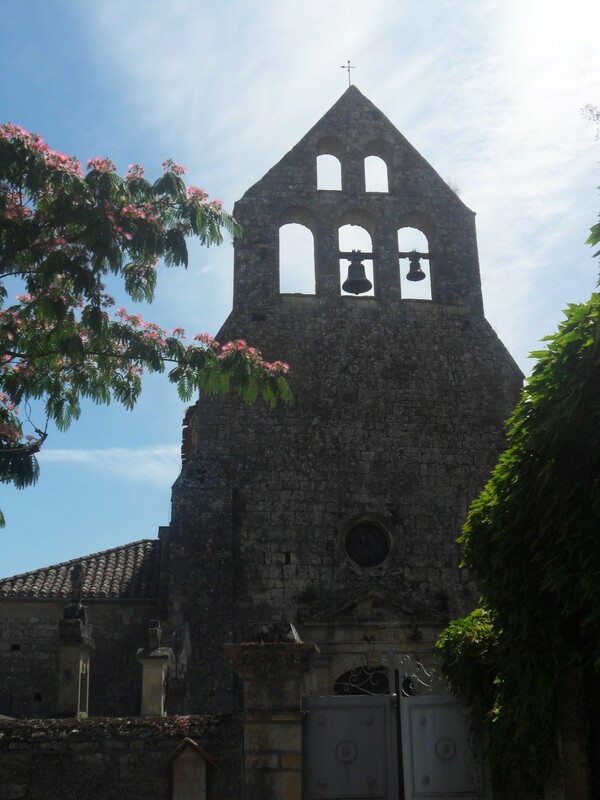 Worth visiting just a short distance off the track is the pretty village of Cavagnac centered round the church. 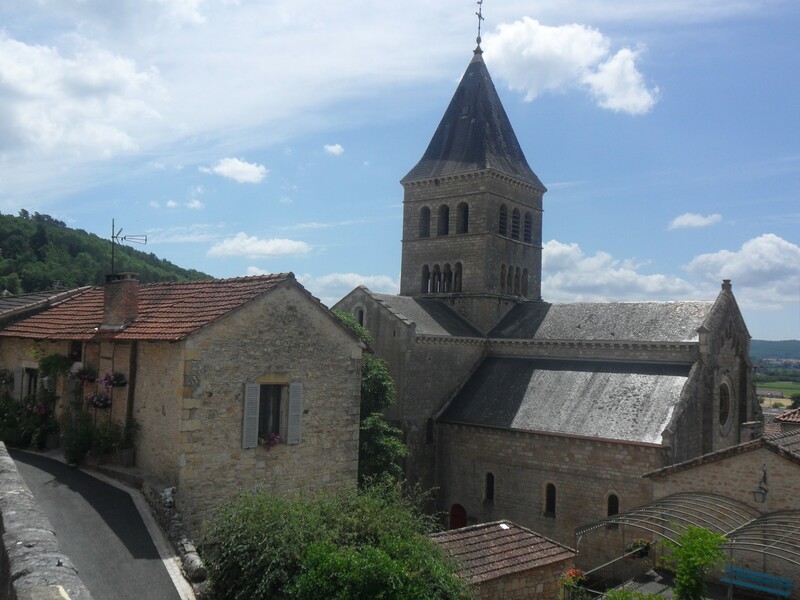 As you leave the village steeply downhill there are views towards the valley of La Theze and the next village to be visited, ancient Saint-Matin-le-Redon. The cliffs on the right, Montcabrier, have given me good days climbing in the past. The cafe in the village has closed long ago. 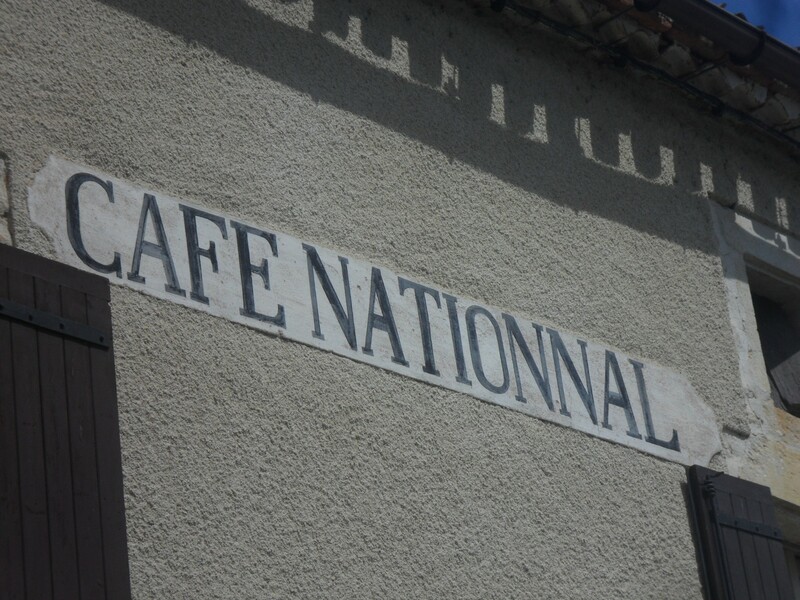 I love these traditional, but now fading, signs on cafes and shops so evocative of France. 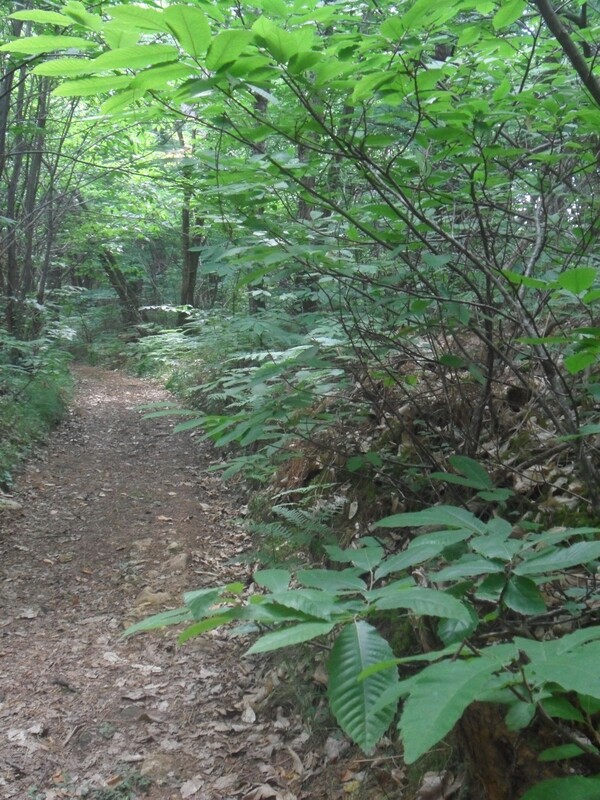 A long ascent over yet another ridge on good paths is made bearable by the shade of the Chestnut trees. 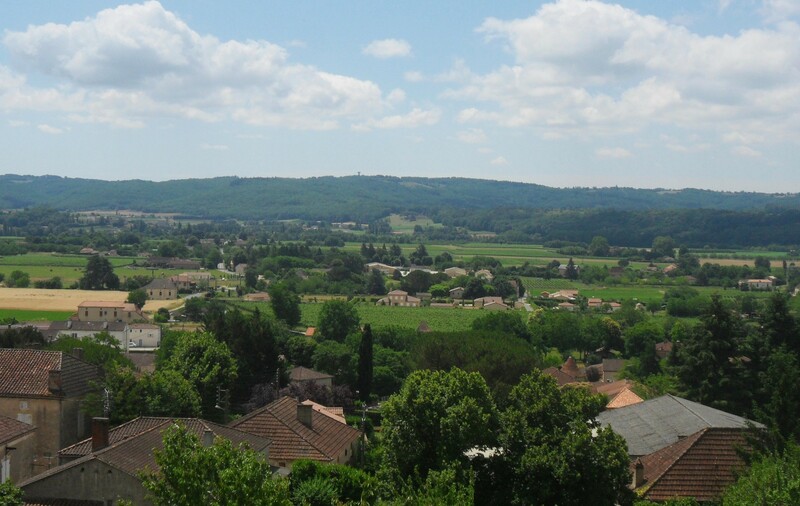 Lanes lead into Duravel giving views across the valley to Vire, numerous family vineyards and the wooded ridges behind with the prominent water tower visible. 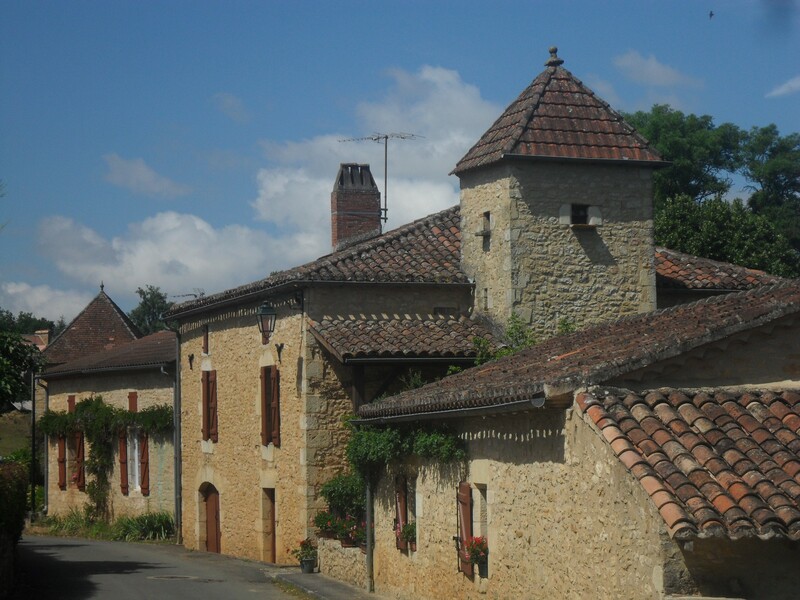 Duravel has pleasant stone houses and narrow alleys surround the medieval church and is worth exploring. Time for a refreshing drink in the Cafe de la Mairie. 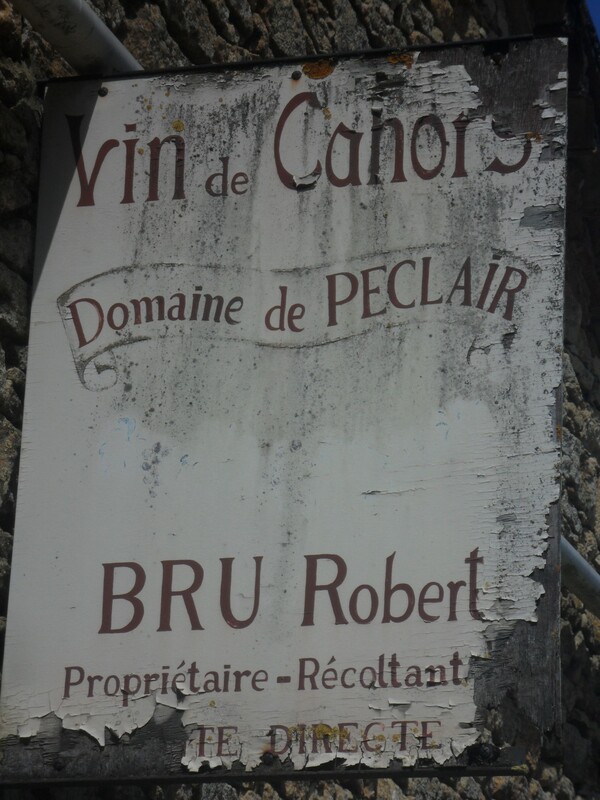 It is difficult to find off road walking back to the bridge over The Lot at Vire-sur-Lot and the road is long and hot – better to phone for a friendly pick up. View over The Lot Valley from Duravel. This entry was posted in France, Walking. and tagged France, The Lot, Walking. on June 28, 2015 by bowlandclimber.